We’d love your help. 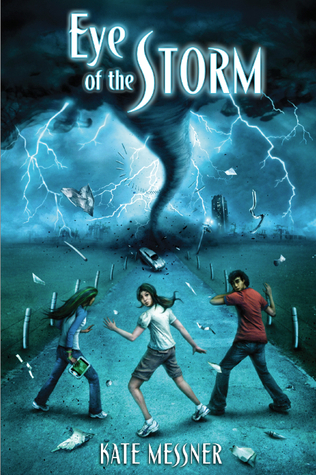 Let us know what’s wrong with this preview of Eye of the Storm by Kate Messner. To ask other readers questions about Eye of the Storm, please sign up. how old is jaden meggs? This is going to be on my "recommend right away" list for my students in the fall. A great mix of mystery, adventure, and science fiction. Fabulous! Set in the "not too distant" future, Eye of the Storm captures a world where climate change has completely altered the landscape. Immense storms sweep through everywhere, altering life as we've known it. Jaden is sent to live with her father in StormSafe community to attend a cutting edge science camp when she uncovers secrets her father is hiding ab This is going to be on my "recommend right away" list for my students in the fall. A great mix of mystery, adventure, and science fiction. Fabulous! Set in the "not too distant" future, Eye of the Storm captures a world where climate change has completely altered the landscape. Immense storms sweep through everywhere, altering life as we've known it. Jaden is sent to live with her father in StormSafe community to attend a cutting edge science camp when she uncovers secrets her father is hiding about his weather research. Environmental "near future" science fiction at its best, this book will appeal to readers who are fascinated with meteorology, climate science, and even mystery. A tiny hint of romance sweetens the tale. Age Levels - Middle grades. Wonders and What Ifs - What will happen if our climate continues to change? How far would you go to protect the ones you love? When is it okay to have secrets or to reveal the secrets of others? Pity the science geeks, the math geeks, and other kids that love a ripping yarn with a grounding in something other than fantasy. When I troll the shelves of the children’s room in my local library it’s just a sea of realistic non-sciencey fiction or tales too outlandish to play with any real world concepts in a satisfying way. The designation “science fiction” often just means that the book is set in the future or contains aliens. There’s not going to be a ton of real science involved. Enter, o Pity the science geeks, the math geeks, and other kids that love a ripping yarn with a grounding in something other than fantasy. When I troll the shelves of the children’s room in my local library it’s just a sea of realistic non-sciencey fiction or tales too outlandish to play with any real world concepts in a satisfying way. The designation “science fiction” often just means that the book is set in the future or contains aliens. There’s not going to be a ton of real science involved. Enter, of all authors, Kate Messner. Best known up until this point for her picture books, and chapter titles featuring plucky young women who go against the grain (Marty McGuire, The Brilliant Fall of Gianna Z, Sugar & Ice, etc.) Messner tries something a little different with a true dystopian tale. There’s still the requisite plucky young girl in place, but her tale really hinges on the true-to-life science found in Eye of the Storm’s core. For all those kids that found the tornado at the beginning of MGM’s The Wizard of Oz super freaky, prepare for some serious turbine terror. The cool thing about having a mom who’s a scientist is that she gets to do projects deep into the jungles. The bad thing is that when she does this you could wind up stuck with a father you doesn’t eve know. Years ago Jaden's parents split up and ever since then she’s lived with her mom while her dad followed his weather research. It’s the near future and due to global warming the weather has gone mildly insane. Tornadoes spring up with frightening regularity in middle America and Jaden has learned to fear them. That’s why when her dad takes her to a community named Placid Meadows she has a hard time believing that the place is impervious to storms. Yet somehow that seems to be the case and Jaden is convinced that the technology behind it could be used to dissipate all tornadoes. What she doesn’t expect is to find that her father is a man clearly different from the one who left her behind all those years ago. This one seems driven to an almost fanatical point and whatever it is he’s planning, Jaden is becoming convinced it isn’t for the greater good. Authors who write books set in the future are in a bind. On the one hand, if you want a danger like an ecological meltdown to feel immediate then setting your book in the near (rather than distant) future is the way to go. On the other hand, if you write a book and it contains words along the lines of “In the year 2025” your novel is going to be anything but timeless when old 2025 rolls around. Maybe the only real solution is to do away with a distinct year altogether. In Eye of the Storm we don’t open the book to a particular year. Instead we get little clues that hint at the year. The poet Rita Dove is thought by Jaden to be “in her nineties now”. Jaden’s grandfather apparently enlisted in the military after 9/11. So even if this book sticks around for a hundred years, the time period won't age all that badly. Now the science in this book is intense. In the course of this novel Jaden joins a kind of summer camp university where kids can test out their theories on storm dissipation in cool and costly labs. Messner clearly did her research (her Acknowledgements even act as a partial Bibliography, which is nice) since the kids in her book know their chops. I admit that I did zone out once or twice when the technical aspects of tornado formation were bandied about, or the logic behind the kids’ experiments escaped me. These passages may prove fascinating to a certain breed of Weather Channel watcher, but happily those who wish to skim them will be none the worse for the wear as a result. I also liked the incorporation of poetry with science too. It seems strange to say that you would have to sell kids on the notion of literature and science coming together when they’re already reading this book, but a little additional positive reinforcement couldn’t hurt any. For the most part I was on board with the story from start to finish. There was a high stakes moment near the end when I thought it mighty strange that Jaden didn’t call her father (she knew he had the power to change the problem she was facing) but other than that the book reads well. Basically what we’ve got here is a weather mystery. Such a genre does not technically exist (YET!) but as our own environment succumbs to our wasteful whims we could be seeing more books along Messner’s lines being produced in the future for the 9-14 set. Seems to me that sometimes we should separate our fiction into science fiction and science-science fiction. Eye of the Storm is certainly in the latter category and will prove to be interesting to both science lovers and those readers who just like a whole lot of destructive tornadoes bashing about wrecking havoc. Exciting and informative by terms, this is one little hard-to-categorize novel that slips easily into the “great read” slot. Future meteorologists rejoice! Eye of the Storm is an older middle grade dystopian novel. It follows in the recent trend of dystopian novels with a basis in science. Which makes me smile happily every time. In the not so distance future due to climate change, tornados have become the greatest threat to mankind. Formerly regulated tornado alley in the Midwest, they're everywhere now. The storms have gotten so bad that their are roadside shelters along every Interstate, students are homeschooled via computers and playing outsid Eye of the Storm is an older middle grade dystopian novel. It follows in the recent trend of dystopian novels with a basis in science. Which makes me smile happily every time. In the not so distance future due to climate change, tornados have become the greatest threat to mankind. Formerly regulated tornado alley in the Midwest, they're everywhere now. The storms have gotten so bad that their are roadside shelters along every Interstate, students are homeschooled via computers and playing outside has ceased to exist (okay that might be the present). The day after I finished this book we had tornado warnings in Kentucky. Let's just say this book did not help my weather-panic. This book is near flawless. The characters, even the bad guys, have believable motivations. The pacing was spot-on, the first half of the book slowly building then the second half everything coming to fruition. Once the rising action and main plotline started rolling I had trouble stopping reading. Probably the only real flaw in this book, in my opinion, was that I had trouble believing the characters were only 13. They were the brightest minds of their generation, but they were trying to solve scientific concepts that I had trouble grasping (storm dissipation using satellites and focused microwave energy). But honestly, in the grand scope of flaws that's something I can live with. I'd rather read a novel with smart kids than a novel that treats kids like they are stupid. Great dystopian for the younger sect. With science, the tingles of first crushes and the terror or tornados where can you really go wrong? WHAT I LIKED: Eye of the Storm started out promising. Jaden is a young girl--a very smart girl, bonus!--who goes to live with her dad after he has been studying storm development in Russia for years. He has a new wife and baby daughter, neither of whom Jaden has met before (cue adolescent angst). Jaden attends science camp, and quickly befriends Risha and falls in like with Alex. All this against a backdrop of killer tornadoes and sinister science, More reviews at http://readerpants.blogspot.com. WHAT I LIKED: Eye of the Storm started out promising. Jaden is a young girl--a very smart girl, bonus!--who goes to live with her dad after he has been studying storm development in Russia for years. He has a new wife and baby daughter, neither of whom Jaden has met before (cue adolescent angst). Jaden attends science camp, and quickly befriends Risha and falls in like with Alex. All this against a backdrop of killer tornadoes and sinister science, and the book sounds like a recipe for success. *Summary: Jaden lives in the not too distant future where tornadoes have intensified and are a constant threat. Jaden's father is the head of a corporation that studies tornadoes and that built a StormSafe neighborhood where the storms cannot get in. Jaden's father has not been too active in her life for the last couple of years, but when she is invited to visit him and attend a world-renowned science camp in a neighborhood that doesn't get tornadoes- it is a win-win situation. And everything is going really well. Jaden has been grouped into the meteorology section of the camp, she has made friends and is partnered with a really brilliant, nice boy named Alex. It is great. Except that something really weird is going on with her dad. He isn't himself- he only talks about work, is really intense, and isn't the comforting man that Jaden remembers. The tornadoes, the neighborhood and his company have become his obsession. So Jaden decides to discover the truth behind her father's obsession and the truth is horrible- worse than she could even imagine. What I Think: Wow! This book jumps right in! Within the first couple of paragraphs you are thrown in the middle of a tornado that is barreling down on Jaden and her father. And the terror never ceases. Even when you start to get comfortable, you are on the edge of your seat because you know that something is going on. This future in general terrifies me. Tornadoes are the thing that I probably fear the most. I lived in tornado alley until I was 14 and have been too close to tornadoes. I had reoccurring nightmares about them all of my childhood. They were an obsession and a fear. So Jaden's future is fascinating, but also my worst nightmare. And what makes Jaden's world even worse is that with the addition of the intense tornadoes, it seems like most joy was taken from her world- no more museums, ballet, poetry, Disney, pleasure reading, classroom learning. All of the things that make our world a place that I love- gone. My reaction to this aspect of the book reminded me of the same reaction I have with The Giver when I was in middle school. I cannot imagine a world where these joys are sucked away. Oh, and I haven't even mentioned how well Kate writes. The imagery that she creates, specifically when it comes to the tornadoes, is what makes the book. The ability to visualize what she has created so you feel like you are there with Jaden moves the story to the next level. This book, one that I was lucky enough to win from a Goodreads give away, came just in time for the start of our school break and it is a good thing it did because I would surely have been late for work when the excitement grew to hefty for me to stop reading for something as mundane as classes to teach. Having read Kate Messner's Sugar and Ice, I was expecting a sweet, good book about nice kids with moderate issues. In short, I did not expect to be blown away. But I was blown away by how the exc This book, one that I was lucky enough to win from a Goodreads give away, came just in time for the start of our school break and it is a good thing it did because I would surely have been late for work when the excitement grew to hefty for me to stop reading for something as mundane as classes to teach. Having read Kate Messner's Sugar and Ice, I was expecting a sweet, good book about nice kids with moderate issues. In short, I did not expect to be blown away. But I was blown away by how the excitement grew to a fever pitch as kids in 2050 battled with the frequent ravages of tornadoes. As someone raised in Montana where funnel clouds were rare, I never have thought much about this weather phenomena, even after moving to the Midwest. I will never think about tornadoes the same way again after reading this book. Jaden is sent to spend the summer with her father, a world famous meteorologist who works for the government on storm dissipation. The world is now ravaged by the effects of climate change, making storm cellars a must for every home, business, and gathering spot. Every home, that is, except the ones in the special community of Placid Meadows that her father has created. Jaden has come to a part of a special program for smart, scientific kids. There is romantic interest and some very minor issues settling in with her father and his new wife, but the thrust of the story is the study of these tornadoes and the shocking realization that all is not as it should be. Jaden's father has a deep and horrible secret, or maybe several secrets. Jaden and her friends must determine what is really going on at STormSafe Headquarters and then stop the unthinkable from happening. I loved the references to the "old" days of 2012 such as appreciation of gas driven vehicles and paper books. Messner does a great job of naming items like the DataSlate and BeatBuds so we know exactly what they are without needing further description. Eye of the Storm is a futuristic thriller about weather! If you had told me I would like a book about weather, I would have said, "You're crazy!" but this IS a book about wild tornadoes set sometime in the future, and I didn't want to put it down. A great read aloud choice too! Tornadoes can be fascinating... and frightening. Usually, there is an eerie calmness before the sky turns a greenish hue and blackens. A stinging wind stirs the air with dead leaves and dirt before sirens wail. Panicked, you scramble indoors to safety. Now, close your eyes and imagine a future where tornadoes occur so frequently that you can't even ride a bike outdoors. Or go on a hike. Or feel the wind on your face as you swing. Instead, you live in concrete bunkers or underground where it is sa Tornadoes can be fascinating... and frightening. Usually, there is an eerie calmness before the sky turns a greenish hue and blackens. A stinging wind stirs the air with dead leaves and dirt before sirens wail. Panicked, you scramble indoors to safety. Now, close your eyes and imagine a future where tornadoes occur so frequently that you can't even ride a bike outdoors. Or go on a hike. Or feel the wind on your face as you swing. Instead, you live in concrete bunkers or underground where it is safe. This is twelve-year-old Jaden's world, set in the year 2050. Tornadoes have become so severe that the Fujita scale has changed from the top level measurement of an F6 to an F10. When Jaden goes to live with her dad and step-mom at Placid Meadows, she finds a community where the tornadoes don't touch down. A community where she can be outside without fear. Jaden's dad has created a technology that protects Placid Meadows, but she hasn't seen her dad in four years and is not sure how the technology works. Jaden asks him questions and while he shares information with her, she knows that something isn't quite right. That the information does not reflect what is happening around her. Jaden digs deeper into her questions as she goes to a science camp to learn about meteorology. She makes friends with Risha, Alex, and Tomas and is paired with Alex who is interested in tornado dissipation like her. The two discover some inexplicable things about the nearby tornadoes that touch down and become determined to solve the mystery of Placid Meadows. Messner does a great job with tension and establishing the characters right away, as well as creating a vortex of themes. When we first meet dad he is in the car with Jaden and they are trying to not get stuck in a tornado. They are racing to a shelter as debris and wind threatens to engulf their car. Jaden's dad isn't frightened. If anything he loves it and appears addicted to severe weather. He tells Jaden not to worry and is oblivious to the fact that she is terrified. The reader quickly learns that dad is single-minded and doesn't respect other people's wishes to not live in an artificial environment like farmers or Aunt Linda. He is bent on building Phase II of Placid Meadows and cannot understand why someone would choose a life that is unprotected from severe weather. The genre is dystopia but I would also call it a mystery as well. There is plenty of action, character development, and tension. Jaden is trying to reconnect with her father, make new friends, solve a scientific problem, and understand choices people make as to where to live. I like how this well-crafted story has raging tornadoes that seem to mirror the storm that is going on inside of Jaden as she changes throughout the novel. She has to decide between saving other people or going against her dad. She also has to learn to trust and believe in herself. It is a multi-layered story that can generate some good book club discussions. Some might find the story filled with too much science and technology but I really enjoyed that side and thought it was balanced with the rest of the story. I also thought Messner was creative in showing some devices that are currently used by storm chasers, such as a mobile meso-net unit and her futuristic device called a DataDrone. Other clever word plays are DNA-ture and DataSlate. I like how Messner uses the librarian who believes that old technology does not mean it is useless technology. So often we are racing off to collect the newest technology without thought as to whether or not it is better technology. I also got a kick out of the Risha's binary coded bracelets that spelled out words. That was pretty funny. I wonder if Messner dreamed that up or if she knows someone who has bracelets like that? There is some romance between Risha and Tomas and Jaden and Alex, but not much happens because they are too busy solving the mystery of Placid Meadows. Teachers could use this book for teaching small moments (pages 53 describes eating something delicious, 55 describes swinging) or the scientific method where students at camp are learning if-then statements and hypothesis (page 38). Our students are crazy about science and this should be a hit with them. This fast-moving book will appeal equally to boys and girls, science nerds and kids who haste science but care about the environment. Jaden Meggs lives in a future that seems probable given the climate change that is already happening. Big storms like Hurricane Katrina have changed not only the physical landscape, but in Jaden’s world, the way life is lived. Jayden goes to spend the summer with her father, a world-famous storm expert who has designed and is profiting from a storm-proof community This fast-moving book will appeal equally to boys and girls, science nerds and kids who haste science but care about the environment. Jaden Meggs lives in a future that seems probable given the climate change that is already happening. Big storms like Hurricane Katrina have changed not only the physical landscape, but in Jaden’s world, the way life is lived. Jayden goes to spend the summer with her father, a world-famous storm expert who has designed and is profiting from a storm-proof community in Oklahoma. She makes friends with other smart kids attending Eye on Tomorrow, a high-quality science camp. The world Messner has created feels only once-removed from our own, so younger readers will recognize their own reality as well as what life might be like if tornadoes and hurricanes continue to destroy homes and communities. Readers will also identify with Jaden’s mixed feelings toward her father (who is divorced from her mother, remarried, with a young child), with the kinship she forms with science camp friends, and the lusciousness of a first kiss…or a non-GMO strawberry. I must confess that I did not read every word of the last chapters…because I was anxious to see how the book ended! I skimmed and occasionally even jumped ahead because of the tension. Could a group of good-hearted and intelligent youth triumph over power-hungry adults? Could their problem-solving efforts save people and homes from monster storms? But I like how it incorporates students who are proficient in science (both girls Just finished this last night ... and it was a nail biter! At this point, I think I consider myself a Kate Messner fan. This is a sci-fi book that takes place in a future where superstorms are the norm, and the government is trying to figure out a way to stop them. The kids in the book are part of a camp that study these storms, and the main character's father is up in the hierarchy. Of course, the kids do uncover something rather sinister, and they take it upon themselves to stop it. It's a fun, surprising read, and something that's not always well cover At this point, I think I consider myself a Kate Messner fan. Rereading as a classroom read aloud, November-December, 2012. Smart lead, fast action, believable premise. Loved it! Definitely a 4.5! Loved the science and intensity of the story. Strong, curious characters. Lots of science, suspense, and smart kids ~ loved this one. Jaden loves living in Vermont with her mom, a scientist who studies frogs, but when her mother needs to spend the summer in Costa Rica, she's excited to spend the summer with her father, stepmother and baby half sister in Placid Meadows, Oklamhoma. This is a community that her father's company, StormSafe, has created in a world that is constantly rocked by tornadoes and hurricanes. At a vague point in the future, the weather has become so bad that children no longer are allowed to ride their bik Jaden loves living in Vermont with her mom, a scientist who studies frogs, but when her mother needs to spend the summer in Costa Rica, she's excited to spend the summer with her father, stepmother and baby half sister in Placid Meadows, Oklamhoma. This is a community that her father's company, StormSafe, has created in a world that is constantly rocked by tornadoes and hurricanes. At a vague point in the future, the weather has become so bad that children no longer are allowed to ride their bikes, all houses have safe areas, and crops are predominately "DN-ature"; hybrids produced to be grown more quickly and uniformly. Jaden gets accepted into a summer meteorological program that StormSafe runs for children, and meets Risha, Alex and Tomas, who are all interested in figuring out how storms work as well. For Alex, it's very personal, because his family runs a farm that is quite battered by the storms, but which they do not want to sell to StormSafe. When Jaden is trying to figure out how to run her storm simulations, she runs across information that leads her to believe her father might not have the best interests of everyone at heart. Can Jaden and her friends safe Alex's farm, or will the increasingly bad storms wipe out everything they love, even Placid Meadows? Strengths: Wow. Of course, I loved The Brilliant Fall of Gianna Z. And Sugar and Ice was fantastic. So I thought "Hmmm. Can Messner really pull off science fiction?" Boy, howdy, can she ever. I don't want to give away the plot, so couldn't really describe the entire last half of the book, but the list of brilliant touches in this is lengthy. The exact date when this takes place is vague, although we do have Jaden's grandfather killed right after 9/11. The every day technology that Messner introduces is brilliant. Data Slates that everyone carries, the genetically modified food-- and every time I would come across one, I would think "Hmmm. This could happen, and soon!" The names aren't overly goofy-- brilliant. The fact that several important characters turn out to be rather evil was a marvelous touch, and there was even some light romance. The suspense and action at the end were fantastic. While the main character is a girl, I see this being equally popular with the boys. Ms. Messner, you have hit this one right out of the park! If you want to quit teaching now and devote yourself to writing full time, you have my full support! With it's blend of science, intelligent kids, mystery and set in a dystopian world, Eye of the Storm makes for an exciting read for both older middle grade readers and older fans of MG books. Kate Messner does a fabulous job at creating a not so distant feature were the characters not only genetically engineer their food, but they control the weather and live in communities that are safe havens for the increasingly strong storms, unlike what we see in our day. Kate's blend of science with her dy With it's blend of science, intelligent kids, mystery and set in a dystopian world, Eye of the Storm makes for an exciting read for both older middle grade readers and older fans of MG books. Kate Messner does a fabulous job at creating a not so distant feature were the characters not only genetically engineer their food, but they control the weather and live in communities that are safe havens for the increasingly strong storms, unlike what we see in our day. Kate's blend of science with her dystopian world make for an incredibly intriguing setting and story. I really enjoy the way Kate was able to explain the meteorology & scientific part of her story line so that someone like myself was able to understand what was going on and what Jaden was both working on and working to uncover. Jaden is a fun character to get to know. When the story starts she's sent to spend some time with her workaholic father in the storm safe community of StormSafe. Not only did her father create this place, but it's a place that protects the select people who live there from the monstrous storms that now plague every day life. While there, she's also going to be attending the elite science camp, Eye on Tomorrow, a camp her father also founded, to learn how to control and stop these monstrous storms. Jaden isn't just an intelligent kid, she's fun, she thinks things out, is a loyal friend, and is a heroine. During Jaden's time with her father and time at camp she starts to uncover some startling discoveries with her father's company. I really admired Jaden's desire to find the truth and help save those who are in the path of a seriously deadly storm. GUYS!!! THIS BOOK WAS SO GREAT! Middle-grade book with a female protagonist who loves science and is ENCOURAGED in her scientific pursuits! Futuristic (though not too long in the future - someone my age now (24) would be a grandma in this book - about 40 years) dystopia where climate change has really become a big problem, especially in the past few years, and huge storms/tornadoes happen at least every day. No one is really safe going outside much anymore, so everyone has moved inside and pretty GUYS!!! THIS BOOK WAS SO GREAT! Futuristic (though not too long in the future - someone my age now (24) would be a grandma in this book - about 40 years) dystopia where climate change has really become a big problem, especially in the past few years, and huge storms/tornadoes happen at least every day. No one is really safe going outside much anymore, so everyone has moved inside and pretty much does everything inside (no more bike rides, ballet and theater shows are shown over the tv and never in person, etc). Jaden's father is a leading meteorologist in the field and he and his company have created a town where the storms CANNOT hit. They just do not hit! They always veer away from the town, and for this reason, they can charge oodles of money for people to live there. Jaden goes to spend the summer with her dad and attend the Eyes On Tomorrow summer science camp for tweens/teens, where kids are provided with top-of-the-line research equipment and they study the things they are interested in that will some day change the world! Like, real science stuff! Cloning and bio-engineering food and robotics, and of course, weather (specifically storm dissipation)! Jaden chooses to study weather systems as she spends the summer trying to get to know her dad (and a cute boy who lives outside of the town). This book had everything: mystery, adventure, science fiction, a touch of romance (nothing more than a kiss! ), and a strong female protagonist who loves and is good at science (plus a boy who appreciates that!). Kate Messner is a queen when it comes to middle-grade contemporary literature, but her take on MG dystopian does not disappoint. EYE OF THE STORM is a relevant story that contains the meticulous research and believable characters that are trademarks of Messner’s writing. It’s hard to read EYE OF THE STORM today and not think of the frightening tornadoes that have recently hit the US. It makes the premise all the more believable, the book all the more a great read for kids. Messner blends meteorol Kate Messner is a queen when it comes to middle-grade contemporary literature, but her take on MG dystopian does not disappoint. EYE OF THE STORM is a relevant story that contains the meticulous research and believable characters that are trademarks of Messner’s writing. It’s hard to read EYE OF THE STORM today and not think of the frightening tornadoes that have recently hit the US. It makes the premise all the more believable, the book all the more a great read for kids. Messner blends meteorological science seamlessly into a fast-paced plot, and the book’s message—that if we don’t start doing something about today’s global warming, then the future will be grim indeed—is quite clear. It’s the best way to give kids an important lesson: cool science tossed into an exciting story, the moral easily extrapolated from the all-too-possible setting. Some things that did frustrate me a little with EYE OF THE STORM were how polarized the adults were, and how dramatic the plot and narration got at times. EYE OF THE STORM felt very much like an “adults did bad things, and now it’s up to us kids to fix the problem” tale, which to me felt like the too conveniently easy way to drive the story’s message home to readers. The last half or third of the book felt like an endless event of friends screaming life-or-death orders/suggestions to one another, storms tearing up things, and glass shattering. Think a scene from the movie Twister, only played out over the course of 100 or so pages. The marathon demands on my heartbeat were rather exhausting and perhaps, I think, not that necessary. It's 2050 and global warming has caused monster storms to pop up all over, to the point that it's not safe to do everyday activities like ride your bike, go to public events such as concerts or dances, or ever be caught far from a safe room. Everyone carries a DataSlate so they have instant notice of a storm moving into the area. Jaden has just come to spend her summer with her dad in Oklahoma, an area that has many more storms than her homestate of Vermont, but her Dad assures her that there wi It's 2050 and global warming has caused monster storms to pop up all over, to the point that it's not safe to do everyday activities like ride your bike, go to public events such as concerts or dances, or ever be caught far from a safe room. Everyone carries a DataSlate so they have instant notice of a storm moving into the area. Jaden has just come to spend her summer with her dad in Oklahoma, an area that has many more storms than her homestate of Vermont, but her Dad assures her that there will be no danger. Her father lives in Placid Meadows, a stormsafe community that he created in which you are always safe from the storms. Somehow, if a storm is headed to Placid Meadows it will mysteriously turn toward another direction. In the near future, climate has changed in way that allows for powerful storms much more often. So often, in fact, that children no longer ride bicycles, outdoor picnics are a joy of the past, and there are storm shelters every 15 miles on the highway so no traveller is far from refuge. Jaden’s father is a renowned meteorologist who has studied storm dissipation for years, but after the failure of his last project, has funneled his energy into Placid Meadows, a safe community in the middle of Okl In the near future, climate has changed in way that allows for powerful storms much more often. So often, in fact, that children no longer ride bicycles, outdoor picnics are a joy of the past, and there are storm shelters every 15 miles on the highway so no traveller is far from refuge. Jaden’s father is a renowned meteorologist who has studied storm dissipation for years, but after the failure of his last project, has funneled his energy into Placid Meadows, a safe community in the middle of Oklahoma that no storm ever touches. Jaden comes to stay with her father over the summer to study at Eye On Tomorrow, an exclusive children’s science camp. There she meets Alex, a local whose farm is threatened not just by storms, but also by Jaden’s father’s expansion plans. This is a different look at Kate Messner's writing history, a novel set in the future where the world holds huge thunderstorms and tornadoes. These storms have forced most to move into safe areas with managed weather, but a few rebels hold out, trying desperately to keep their land. I love that there is a female protagonist, Jaden. She is the daughter of a scientist who runs this laboratory and who manages the storms using satellite power. Jaden, on this her first visit with her father for a lo This is a different look at Kate Messner's writing history, a novel set in the future where the world holds huge thunderstorms and tornadoes. These storms have forced most to move into safe areas with managed weather, but a few rebels hold out, trying desperately to keep their land. I love that there is a female protagonist, Jaden. She is the daughter of a scientist who runs this laboratory and who manages the storms using satellite power. Jaden, on this her first visit with her father for a long time, manages to interrupt his work and to find his big secret operation is not so nice as she had thought. Action builds time after time as Aiden tried to repair what her father has already started. There are surprises in the book which satisfy and the sidekicks of Jaden who try to warn her that something is not right. There are some scary moments. I suspect if she had been any older, she would have been in even more hot water. It's an interesting idea to use huge storms as one of the ingredients of dystopian survival, to the point that many build 'safe' rooms, something like the old 'root cellars'. I adore Kate Messner and everything she writes, so it is unsurprising I would love this one. Except this isn't like anything she's written before. The book takes place in the "not too-distant future." Storms have become monstrous. Jaden's dad studies storms. She has gone to spend the summer at a community he has created where people are safe from storms and study them at the same time. At the camp Jaden makes two friends and together they begin to try and figure out where these storms are coming I adore Kate Messner and everything she writes, so it is unsurprising I would love this one. Except this isn't like anything she's written before. The book takes place in the "not too-distant future." Storms have become monstrous. Jaden's dad studies storms. She has gone to spend the summer at a community he has created where people are safe from storms and study them at the same time. At the camp Jaden makes two friends and together they begin to try and figure out where these storms are coming from and how they can be stopped. It seems everywhere you turn, there's a YA book about the impending, terrible future. This books takes on climate change and genetically modified fruit. The main characters deal with extreme tornadoes to the point that the scale has to be increased and a corporation called StormSafe has gained government approval to research and test weather manipulation in order to dissipate the storms. But is that all they are doing? Not the most interesting read, and definitely not the best of the SCJBA nomin It seems everywhere you turn, there's a YA book about the impending, terrible future. This books takes on climate change and genetically modified fruit. The main characters deal with extreme tornadoes to the point that the scale has to be increased and a corporation called StormSafe has gained government approval to research and test weather manipulation in order to dissipate the storms. But is that all they are doing? Kate Messner is an award-winning author, TED 2012 speaker, and former middle school English teacher. Her books for kids include THE BRILLIANT FALL OF GIANNA Z.,SUGAR AND ICE, and EYE OF THE STORM (Walker/Bloomsbury Dec. 2010) the MARTY MCGUIRE series (Scholastic), SEA MONSTER'S FIRST DAY, and OVER AND UNDER THE SNOW (Chronicle, Books). Kate also wrote SPITFIRE and CHAMPLAIN AND THE SILENT ONE, bot Kate Messner is an award-winning author, TED 2012 speaker, and former middle school English teacher. Her books for kids include THE BRILLIANT FALL OF GIANNA Z.,SUGAR AND ICE, and EYE OF THE STORM (Walker/Bloomsbury Dec. 2010) the MARTY MCGUIRE series (Scholastic), SEA MONSTER'S FIRST DAY, and OVER AND UNDER THE SNOW (Chronicle, Books). Kate also wrote SPITFIRE and CHAMPLAIN AND THE SILENT ONE, both Lake Champlain historical novels published by North Country Books. Kate lives with her family on Lake Champlain, where she loves to read, write, hike, swing on birch trees, and eat chocolate. She also hangs out in various places online.